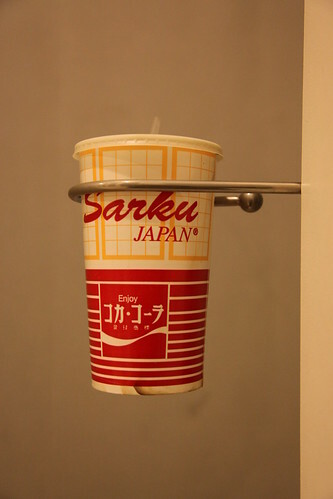 In the food court upstairs, for the longest time, was a Japanese hibachi fast food restaurant called "Sakkio Japan". Their cups were bi-lingual and included the Japanese Coca-Cola logo which presumably reads "Enjoy Coca-Cola Classic" in Japanese. It is interesting to find this here because Sakkio Japan, like many stores in the mall, had been closed for years as of the date of this photo.